Thanks for starting me off with an easy-to-answer softball question. No contest: My favorite part of writing is the creative process, especially when a full novel or story comes to life in my head, complete with all the elements fitting seamlessly. When my characters start speaking to me without my manipulation, dictating to me how they will react to their circumstances, what they will say, what their goals are and how they plan to overcome the obstacles preventing them from accomplishing those goals, I know the story and characters have achieved a life of their own. That’s the point where I have to let the story out of my head so it comes to life for others to experience. As many writers do, I call that explosive creative process being “in the writing zone.” It’s an exhilarating feeling unlike any other I’ve ever had the pleasure of experiencing. When that happens, I become merely a conduit for my muse, a physical interpreter who translates into the written word stories of other worlds, people, and events that formerly only existed in the realm of my wild and vivid imagination. Stories are links between two separate minds. They achieve this intimate connection—a real-world form of magic—in a way that no other medium can. Writing, sharing, and reading stories is the truest example of telepathy we can experience as a species. In stories, we climb into the creator’s mind and discover the thoughts of another person without the static interference of verbal communication. In stories, our minds meet. No matter how many times I’m asked this question, I never get tired of hearing it, and still love answering it. Early beta readers of my novels agreed on one principal consensus: My work weaves two or more genres seamlessly. One reader said I “expertly cross genres,” and another called me up in the middle of reading one of my manuscripts and said, “Man, you are just bending reality all over the place. You are The Reality Bender.” And thus my brand was born. I write a blend of sci-fi, horror, urban fantasy, thriller, suspense, and action-adventure, with excursions into post-apocalyptic, paranormal, and the supernatural. Additionally, all my works involve at least some genuine romance—not the bodice-ripping Harlequin type, but rather the discovery of that one incomparable match that completes and inevitably defines a lonesome soul. More importantly, all of my works encompass the ultimate resilience, redemption, compassion, and triumph of the indomitable human spirit. In the end, that’s what life is all about, to me. Great question, as well as a tough one. My most recent completed novel is a high-concept afterlife fantasy, so the most difficult experience in writing it was staying grounded in that whole “indomitable human spirit” concept instead of recklessly flying off into mystical tangents about life after death. After all, the notion of some form of life after death is hands-down the greatest mystery and quandary our species has ever struggled to answer. No greater enigma will ever plague humankind, and if we ever achieve definitive answers, our entire existence will change utterly, forever, a “point of no return” sea change in our evolution as a sentient species. So it was important to “keep it real,” or at least as real as possible in such an ambitious endeavor, especially one with such limitless possibilities. Since we can’t take material possessions with us when we leave this plane of existence, I had to explore the possibility that we do take our most redeeming qualities—our compassion, mercy, forbearance, love, determination, grace, and endurance—with us when we die. Without those qualities, any afterlife existence will be pointless and empty, a Hell of its own. Sharing this particular magic about our purpose with readers is a goal I will always strive to achieve, regardless of the genre or plot concept. A little of both, depending upon how a story initially strikes me and infuses me with a desperate need to write and share it. Some plotting will always be necessary to form a cohesive and contiguous story palatable to readers. However, the most magical moment in the creation of any story is when it achieves a life of its own, and starts dictating to me—my muse—how it unfolds and develops. So a touch of “seat of the pants” writing style is always a vital component to me in breathing life and realism into any story. Approaching writing with an open-mindedness that allows for variations in story arc and plot and character development is a crucial factor in giving my stories the room they need to grow and achieve that unique “life of their own” that makes them compelling and irresistible. Without flexibility in the creative process, stories with too much rigid structure and an unwillingness on the part of the author to allow for a needed change of direction become stifled and occasionally even shackled, thereby preventing them from becoming the illuminating, enlightening, or entertaining experience they can and should be. To put a comical spin to it, I am a big fan of the seat of my pants. What do you feel your books offer readers? Maybe not so much feel, but hope: In addition to what I’ve said above, my books offer readers a unique journey into the realm of the imagination. Add an intense blend of chills, thrills, suspense, revelations, epiphanies, discovery, and a unique exploration of the human condition that takes readers on an adventure to which no price tag can ever truly be affixed. My favorite stories live on in my mind and heart for a lifetime, even decades after I’ve ravenously devoured them. I’m confident my novels and stories will do the same for my readers. Plus, be sure to add boatloads of endless fun, of course. Yes, reading is educational and often inspiring, but above all else, reading is fun. Undoubtedly from the moment I emerged from my mother’s womb kicking and screaming. I’ve always been a creative spirit, and have written stories—however amateur and lacking in maturity many of them may have been—since my elementary school days. I won my first writing award when I was just fourteen, First Place Winner in a short story contest. However, I didn’t seek publication until 2005, after completing my first novel. I will be a writer until I gasp my last precious breath, and take that final journey to the next plane of existence, whatever it may encompass—be it nirvana or oblivion or inexplicable—and I’m certain I’ll be a writer there too, in whatever form stories may exist. A few, principally as a performing musician and recording artist for twenty-seven years. Yeah, I’m a guitarist, a consummate shredder and six-string highwire artist, with the chops and CD collection to prove it. In addition to a career as a film-assembler for offset printing (formerly called a stripper, no kidding) that led to being a plant manager for a printing company for nearly twenty-five years, my musical career prevented me from pursuing my first and greatest love, which is writing. I recommenced serious writing in 2004, and started writing full time in 2009, and since that magic moment, my life has been filled with incomparable joy and awe-inspiring discovery that keeps me soaring through the limitless province of the imagination. There is nowhere else I’d rather be, no other endeavor I’d rather pursue. Crikey, now you know how long I’ve dwelled on this plane and planet. Yeah, I’m a dinosaur, but I’m a survivor and an eternally optimistic competitor, too. Seriously, though, an irresistible “elevator pitch”—the span of time one would have to pitch a story concept to a prospective agent or publisher while on a short elevator ride with them—is a vital tool every writer must learn to perfect. I’ve practiced elevator pitches for each of my novels numerous times aloud, to my dog, in front of a mirror, and to my writing colleagues and beta readers. I’ve even had the opportunity to pitch—in person—four of my novels to prospective literary agents. However, the winners, my traditionally published novels, all achieved publication via email queries rather than face-to-face pitches. But I’m ready to pitch another at any given time; you never know, the next one may be the jackpot winner if I deliver a compelling pitch . . . and don’t stumble over my tongue as if I were asking a gorgeous woman for a date. Speed-dating, gaaaak! That’s as crazy and potentially hazardous as Internet dating, especially for women, because I know for a fact that a lot of creepy dudes lurk in both semi-anonymous mediums. Stalkers and predators, eternal fodder for fiction writers. Hmmm: What if one of them were unique in that, unlike other predators, he . . . ahem. Can’t talk now. Story idea. Gotta go . . . Colleagues and readers have dubbed Kerry Alan Denney The Reality Bender. The multiple award-winning author of A Mighty Rolling Thunder, Jagannath, Soulsnatcher, Dreamweavers, Marionettes, and numerous short stories, Kerry blends elements of the supernatural, paranormal, sci-fi, fantasy, and horror in his work: speculative fiction at its wildest and craziest. With joy, malicious glee, and a touch of madness, he writes reality-bending thrillers, even when the voices don’t compel him to. His protagonists are his children, and he loves them as dearly as he despises his antagonists . . . even when he has to kill them. 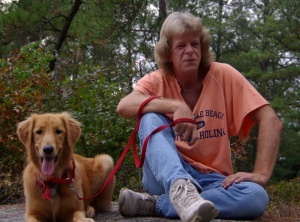 Kerry lives in Stone Mountain, Georgia with his amazing professional Therapy Dog Holly Jolly, where he is currently writing his next supernatural thriller . . . and deciding who to kill in it. The end of the world is just the beginning of the terror . . .
Conor frowned as he gazed upward. Something was wrong with the sky. It seemed thinner in places, as if it were a fragile protective shell about to fracture and let the dark matter of deep space come rushing in through the cracks. In the gathering dusk, the horizon turned a hazy burnt orange, like someone had set fire to the edge of the world, and the flames were consuming the Earth. Conor snorted and dialed back his overactive imagination. Closing his eyes, he rested his head back against the thick grass. He had more urgent, mundane problems to solve, dilemmas that he could understand and act upon—if he could find the solutions. The setting sun winked through the swaying boughs of the trees, painting a moving canvas across his closed eyelids in flickering images of shadow and light. The rustling leaves sounded like angels whispering the story of the gods in a language that made no sense. Conor inhaled the pungent fragrance of rich soil, grass, and honeysuckle, then exhaled in a sigh. Let the angels murmur their indecipherable tale to someone else today. He was here searching for serenity—another graceful thing that seemed to scamper farther out of his reach with each passing day. Although the day had been warm, he shivered as the late May breeze dried the sweat on his chest, forehead, and cheeks. The chilly wind brought a reminder of bitter winters, seeming to warn of a momentous change coming. He grimaced and shook his head. He needed change, but wasn’t some good news way overdue? A happier marriage would be a good start. Especially since Kristy discovered she was finally expecting. Conor tried to pretend it was the best news ever, but who wanted to raise a child in today’s crazy world? Almost a quarter through the twenty-first century, with one country after another murdering their neighbors—all in the name of false gods, Conor believed, whatever the denomination—chaos and madness seemed to have settled in for the long haul. Kristy’s long-winded tantrums certainly weren’t helping. Lately she sounded just like her mother, and one Delia Dinara was one too many. T-Rex’s happy barking helped him shake off his mood. He opened his eyes, sat up, and glanced warily at the sky. It looked fine, a normal early evening sky, and he watched his furry buddy frolic. His goofy four-year-old German shepherd raced through the meadow below him, leaping and bouncing like the startled jackrabbit he was chasing. Conor had a handful of good friends, and a thimbleful of great ones. But he’d never had a friend like T-Rex, probably never would again. T-Rex would never betray him, never leave him—except in the worst, most final way possible. Can’t think about that; not now, not ever. Something in the carefree way T-Rex scampered here, darted there, then bolted in the opposite direction told Conor that maybe his buddy knew and even understood the story of the gods. What if there were some way to infuse humans with that irrepressible joie de vivre, to bottle it and pass it around? The world would be a lot better place to live in, for everybody. Unlike humans, dogs gave their love freely, without suspicion of ulterior motives, or fear of losing their hearts to someone who didn’t return that love. Conor closed his eyes again, imagining the world-as-it-is from T-Rex’s perspective. The wind in your face, so glorious, so elegantly free. Dinner and fresh water waiting at home, no worries. Want to take a nap? This looks like a great spot, and anytime is a good time for a nap. And who wouldn’t want to chase a butterfly and discover where it goes, and why it flutters about so oddly? Best of all, to not wonder or worry about those things when the butterfly escapes you. 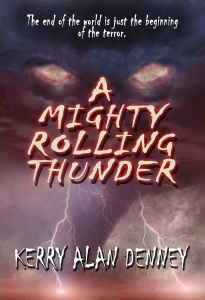 This entry was posted in Guest Blog and tagged a mighty rolling thunder, kerry alan denney, reality bender by Steph. Bookmark the permalink. Thanks Steph! I had a blast with your interview.